This tutorial covers the basic concepts of multithreading in Java. It begins with explaining what is multithreading, and then shows how to create your first threads in Java using two basic approaches – extending Thread class and implementing Runnable interface. Both approaches are explained with Java code examples showing thread creation and execution. Lastly, the tutorial explains the reasons why ‘implementing Runnable’ approach for creating threads is preferred over ‘extending Thread’ approach. Usually when we talk of multi-programming we refer to multiple programs running on a processor. A program is a set of instructions which when executed provides a specific functionality. An example of a commonly used program is a word processor such as MS Word. From the operating system point-of-view executing instances of programs are individual processes with each process having its own memory address space allocated to it. As a process runs, it might need to take care of multiple internal tasks in parallel in order to deliver the complete set of functionalities which it offers. For example, as a person types in the word processor, there are multiple tasks running in the background. One task is responsible for saving changes in the document in a recovery file. Another task checks for spelling and grammatical errors as the user types. Yet another task does the basic task of displaying what a user types in the editor and so on. All the above mentioned tasks are internal to the word processor program, i.e. they share the same memory address space which has been allocated to the word processor by the operating system. At the same time these internal tasks need to execute together or in parallel to ensure the program’s functionalities are available to its users at the same time. Each of these parallel tasks are the smallest units of independent work carried out by program, and are instances of individual threads working to make the whole program work together. To summarize the relation between programs, processes and threads. A program in execution is a process, and an executing process can have multiple threads running in parallel within it to accomplish multiple tasks that the process needs to carry out. The diagram below depicts the relationship between processes and threads. A thread in Java is the smallest unit of dispatchable code which can be executed. As the bigger program executes in a process space of its own, its multiple internal threads carry out their individual tasks and communicate with each other to make the program work as a whole. These internal threads of work use a portion of the memory address space allocated to their parent program/process. As we will see in detail in forthcoming tutorials on concurrency management, this sharing of memory space has both advantages(inter-thread communication) and disadvantages(synchronization issues). Thread management classes in Java are all designed around management of parallel internal threads of work over their entire lifecycle – from creation to destruction. As we study basic and advanced features for multithreading in Java in this and upcoming tutorials in Java Concurrency series, we will cover all aspects related to defining, managing and optimizing threads. To run a piece of functionality in parallel, you will need to first encapsulate it as a separate thread and then execute that thread. Let us now learn how to define and run individual thread instances as per our needs. The first way of defining your own thread functionality involves sub-classing the java.lang.Thread class. An instance of Thread class holds a single thread of execution of a running program. Define a class which extends Thread class. Override the run() method of Thread class, and write your custom thread logic in it. Invoke the start() method on your custom Thread subclass to start the thread execution. Class FirstThread is extends Thread. It overrides the method run(), and provides a simple implementation which prints a single line string. In the main() method of RunningThreads class an instance of FirstThread, named firstThread, is created using its default constructor. firstThread.start() method is then invoked which starts the execution of the code inside run() method of firstThread in a parallel new thread. The newly created thread then executes and prints the line "First thread ran" as output. Define a class which implements Runnable interface. Override the run() method of Runnable interface, and write your custom thread logic in it. Wrap the Runnable instance inside a new Thread instance. This is accomplished by using one of the multiple constructors provided by Thread class which accept the Runnable interface as parameter. Invoke the start() method on the newly created Thread instance to start the thread execution. Class SecondThread implements Runnable interface. It overrides the abstract method run() of Runnable, and prints a single line string as part of its implementation. Class RunningThreads creates an instance of a Thread by using its single parameter constructor which accepts a Runnable instance. A parallel thread of execution for the logic contained in run() method of SecondThread is started by invoking the start() method of SecondThread. The parallel thread started and printed the string – "Second thread ran" as its output. Java allows extending only a single base class. But it allows implementing multiple interfaces. So, if you extend Thread, you cannot subclass any other class. But when you implement Runnable you can potentially extend another class when required. When a thread is implemented by extending Thread class then each thread instance created has a unique object associated with it. On the other hand, when you implement a thread by implementing Runnable, and the same instance is used to create multiple Thread instances, then the same object is passed to different threads. So, if you create ‘n’ threads by using extends Thread, you end up with ‘n’ Thread objects. But when you create ‘n’ threads by using a single instance of class implementing Runnable, you end up with only ‘1’ Runnable object. From a design perspective, if you want to enhance the behavior of any class by overriding multiple of its methods, then you should extend it. So, if you need to enhance Thread class’ behavior by implementing methods other than run() then only you should subclass Thread, else implement Runnable, and pass this instance of Runnable to a Thread to start your parallel thread. Implementing Runnable gives you the option of executing your threads via the Executer framework as it only accepts Runnable instances and not Thread subclasses. In this tutorial we understood the conceptual basics of multithreading, and then learnt how to create and run threads using Thread class and Runnable interface with code examples. We also looked at the preferred way of creating threads and understood the reasons for the preference. In the next tutorial, i.e. 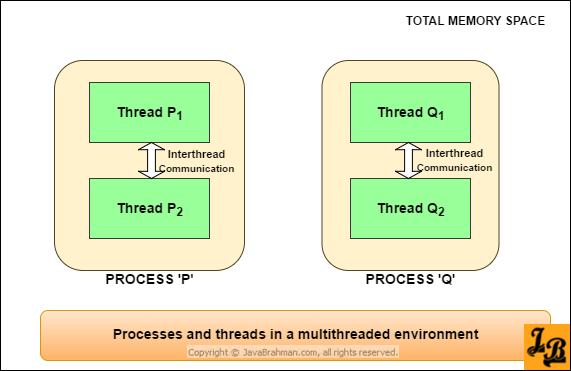 2nd partClick to Read Tutorial on Java Threads’ Lifecycle of Java Concurrency Series, we will go through the lifecycle of a thread, and understand thread state transitions.